This means that, if you have Numbers scripts you used with that 2009 version, most of them should (in theory) now work with Numbers 3.1; those scripts may require tweaks, though, because some features of Numbers itself have changed. 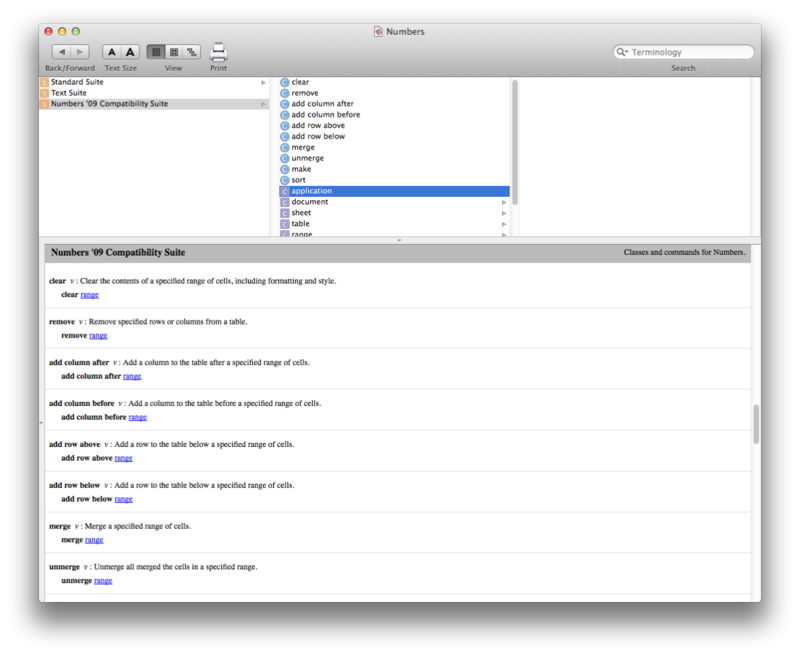 The AppleScript dictionary for Numbers 3.1. Unfortunately, it does not appear that either of the other iWork apps—Pages or Keynote—have yet received the same infusion of AppleScript support. Apple’s stated reason for removing AppleScript support from the original iWork '13 apps was that they’d been redesigned from the ground up (in large part to achieve feature-parity with the iOS versions), and some features weren’t ready in time for that initial release last fall. At the time, Apple committed to making significant improvements to the apps within six months and to reintroducing some features. That list of enhancements included AppleScript improvements in both Numbers and Keynote. (I hope Pages is on their agenda, too.) Looks like the time has come to start fulfilling that promise. Reading into this latest Numbers release, we can perhaps glean some insight into Apple’s strategy for the future of both iWork and AppleScript. First, despite what Mac users may sometimes think, Apple listens. Mac users vocally expressed frustration about the removal of important and widely used automation features, and Apple heard and responded with action. Second, Apple appears committed to making the iWork apps true productivity apps. Third, Apple is still investing in AppleScript. Reintroducing AppleScript support in Numbers wasn’t trivial. The fact that engineering resources were invested in that effort speaks volumes. Years from now, I’d love to be able to look back and see that this Numbers update served as a turning point in the long and arduous lifespan of AppleScript and Apple automation as a whole. 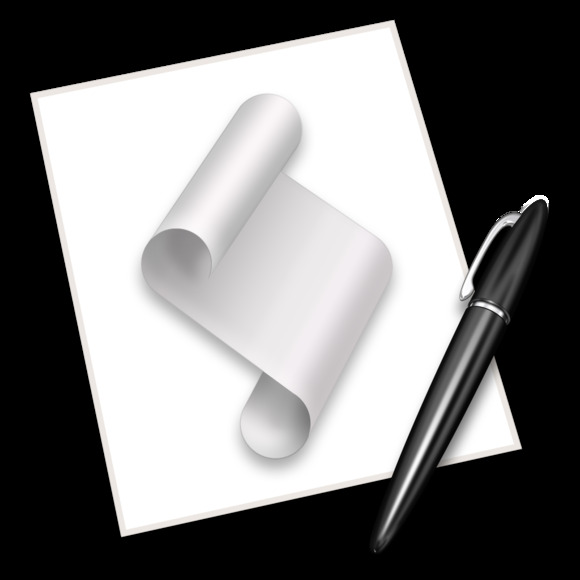 Returning AppleScript support to Keynote and Pages are important next steps, but there are still loads of other Apple apps and features in OS X with limited or no scripting support. Why not implement scripting support across the board, making a statement that encourages third-party Mac developers to do the same? While Automator has wonderful potential as an end-user (translation: non-programmer) tool for automating tasks throughout OS X, it has languished for years and continues to be plagued by limited functionality and broken actions. And iOS developers still have no sanctioned way for their apps to talk with one another. I wish Apple would embrace a consistent approach to inter-app automation, something both Mac and iOS users have been clamoring for. If that resonates with you, you can do something about it: Continue to let Apple know when you run into scripting and other productivity bugs and limitations. If you’re a developer, submit your tickets through Apple’s Bug Reporter system. Otherwise, use Apple’s Product Feedback pages. For now, kudos to Apple for taking this much needed step in the direction of greater productivity on the Mac. But the return of scripting support in Numbers is only a start.